Musa acuminata ssp. burmannica is the name of a subspecies of Musa acuminata, the wild species involved in the domestication of the vast majority of cultivated bananas. 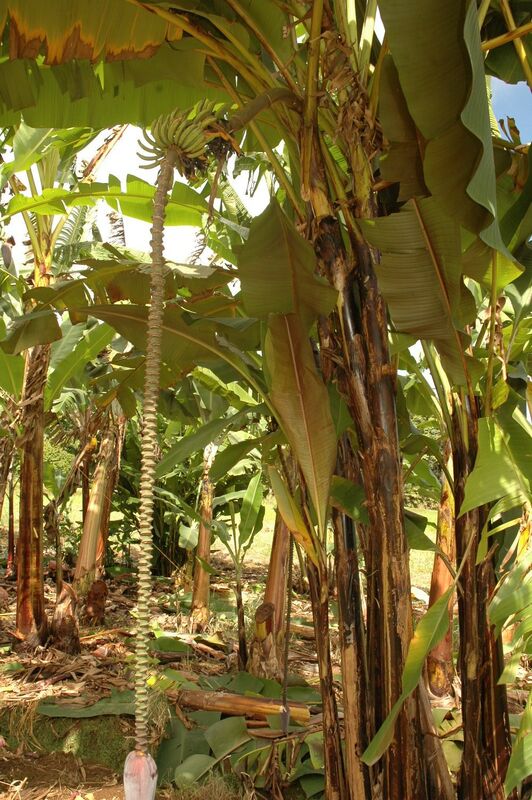 It is one of the four main subspecies of Musa acuminata that contributed to the genetics of edible bananas. Musa acuminata ssp. burmannica is an accepted name in Hakkinen and Vare's chekclist of Musa names, but is considered a synonym of Musa kattuvazhana by R. Govaerts. One of the best known genebank accessions of Musa acuminata ssp. burmannica is Calcutta 4, whose resistance to various diseases has made it popular with breeders. The original recognition of this form of Musa acuminata was made in 1948 by E. E. Cheesman, who although did not formally publish it as a taxon, described it and identified it as the 'Tavoy' form of Musa acuminata, because the specimen came from Tavoy (now Dawei in Myanmar). In 1956, Norman Simmonds formally upgraded its classification to a distinct subspecies. In 1960, De Langhe split Musa acuminata Colla ssp. burmannica Simmonds into two subspecies: Musa acuminata Colla ssp. burmannica Simmonds emend. De Langhe and Musa acuminata Colla ssp. burmannicoides De Langhe subsp. nov.. It was between the original recognition and Simmond’s publication that in 1952 Musa kattuvazhana was published in a monograph on the bananas of the Madras province of India by K. Cherian Jacob. The name fell into obscurity and apparently evaded the notice of Simmonds. If he was aware, it did not draw any suspicions of being allied with the Musa acuminata complex he was trying to sort out. Not a single mention of the species Musa acuminata is made in the monograph. Moreover, a profile of the introduced Musa textilis clearly depicts forms of Musa balbisiana, revealing a less than expert knowledge of wild Musa. In 2016, the once lost and mostly unknown name M. kattuvazhana was revived after extensive field studies, and subsequently identified as being synonymous with M. acuminata subsp. burmannica, as well as M. banksii var. singampatti on literature based morphological grounds. Perhaps too eagerly, and with arguably dubious justification, subsp. burmannica was reduced under M. kattuvazhana. It would seem that perhaps the theoretical combination M. acuminata subsp. kattuvazhana may be more appropriate taxonomically, however even such a compromise is unlikely to be widely accepted as ‘Calcutta 4’ and ‘Long Tavoy’ have both been long ingrained into the Musa research community as belonging to subsp. burmannica. To change course would require monumental revision to the literature and undoubtedly impose much undue complexity in a field which is desperately seeking simplicity and clarity. The material Cheesman described came from Myanmar (then Burma) and comprised two collections: I.R. 124 (Clone Calcutta 4) and I.R. 187 (Clones Tavoy and Long Tavoy). The Burmese name was given in both cases as Taw-byaw, and the two collections differ only slightly in quantitative characters such as size of bunch and length of fruit, important to the banana breeder but not to the systematist. The three clones may therefore be referred to collectively as " the Tavoy form " with the following characters: Upper parts of leaf-sheaths bright green, with heavy reddish brown blotching, not at all waxy; leaf blades not glaucous beneath, midribs pale green or yellowish; petioles relatively stout, with well developed erect margins, very early becoming scarious where appressed to pseudostem. Male bud in advanced blooming acute, the bracts usually distinctly imbricate at the tip ; bracts dark violet-purple and glaucous outside, light red and shining within. Male flowers whitish. Fruit bunch pendulous and compact, its peduncle densely pubescent ; fruit 8-12 cm. long, pedicel very short and not very distinct, withered style tending to persist. According to Simmonds, this subspecies is distinguished by its yellowish and waxless foliage, light brown markings on the pseudostem and by its compact pendulous bunch and strongly imbricate purple bracts. Musa acuminata ssp. burmannicoides is considered a synonym of Musa acuminata ssp. burmannica. The nuclear, choloplastic and mitochondrial genomes of genebank accessions of Musa acuminata ssp. burmannicoides, ssp. burmannica and ssp. siamea accessions are similar. Musa acuminata subsp. siamea, an accpeted subspecies, may also be a synonym. 4. Häkkinen, M. and Väre, H. 2008. Typification and check-list of Musa L. names (Musaceae) with nomenclatural notes. Adansonia 30(1):63-112. 5. Musa acuminata subsp. burmannica N.W.Simmonds, not accepted by R. Govaerts, compiler of World Checklist of Musaceae. Retrieved 19 February 2018. 6. Cheesman, E.E. 1948. Classification of the bananas III. Critical notes on species. Kew Bulletin 3(1):11-28. 7. De Langhe, E. and Devreux, M. 1960. Une sous-espèce nouvelle de Musa acuminata Colla. Bull. Jard. Bot. Etat Brux. 300: 375–388. 8. K.C. Jacob. 1952. Musa kattuvazhana, pp. 129-130 in Madras bananas, a monograph. Madras, India. 9. Joe, A., Sreejith, P.E. and Sabu, M. 2016. The identity of Musa kattuvazhana (Musaceae) with reduction of Musa acuminata subsp. burmannica and Musa banksii var. singampatti as its synonyms. Webbia 71(2):203-208. 11. Carreel, F. 1994. Etude de la diversité génétique des bananiers (genre Musa) à l'aide des marqueurs RFLP. INAPG, Paris-Grignon (FRA). 207p. Page last modified on Friday, 12 April 2019 14:54:38 CEST by System Administrator.